Adeline was born in Karlstad, Minnesota on December 2, 1921, to her parents Ernest and Lena Johnson. Her mother was a homemaker and her father was the local barber. Adeline had three brothers: Floyd, Maynard, and Ray. She graduated from Greenbush High School and attended business college in Fargo, North Dakota. After college, she moved to Tacoma with her brothers, where they all worked at the Naval Shipyards in Bremerton during the war. Adeline met Stuart, the love of her life, on a blind date. As luck would have it, her friend could not make it so Adeline went in her place. Stuart was persistent and after some time, they married and enjoyed 69 wonderful years together. Adeline and Stuart raised two sons, Paul and Jim, in Seattle, Washington. After the boys finished high school, Adeline and Stuart designed and built a beautiful home on Mercer Island. During Stuart’s employment with PACCAR, he was offered the position of Vice President and General Manager of a Sicard plant in Watertown, New York, which was a company that built snow blowers, loaders, runway sweepers, and logging equipment. It was a huge decision to leave family and their beautiful home, but an amazing opportunity for both of them. While living in Watertown, New York, Adeline discovered golf, and fell in love with the sport. After just three lessons, she went on to belong to multiple women’s golf groups, including groups later in Los Altos, California and Lakeland Village. She developed lifelong friendships along the way. Over time, she decorated her shelves with golfing trophies. After a few years in Watertown, Stuart was offered, and accepted, a position as Off Highway/Export Sales Manager with Peterbilt Motors Co. This job took them to Los Altos, California, where they made their home. When the time was right, Adeline and Stuart then made the decision to retire in Lakeland Village, Washington, to be closer to family. Each of these chapters was special in itself with new homes, friendships, and interests. Family was always the top priority for Adeline and Stuart. She said that although she enjoyed working, she found a greater happiness in making a home for her husband and sons. The common denominator for all family and friends, was that both Adeline and Stuart were genuinely interested in all their lives and made time to always be present for them. They taught us all the value of hard work, family, faith, integrity, and love. Adeline was a phenomenal cook and baker. She was famous for her tasty bars and made the best oatmeal cookies! We were always the lucky ones! During the holidays, the family savored her assortment of homemade pies. From pumpkin pie, to pecan pie, to huckleberry pie; each tiny berry was carefully handpicked and each pie was made with an abundance of love. 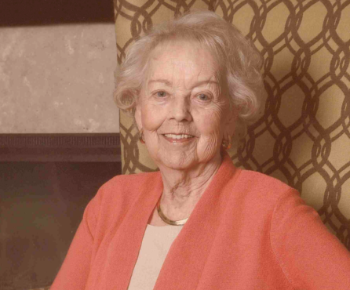 She spearheaded the “Favorite Recipes Cookbook,” complied by the ladies’ golf club at Lakeland Village in 1981. Adeline enjoyed being a wife, mother, grandmother, and auntie. She loved being a homemaker, and was skilled in sewing and knitting. It was important to her to share her handmade treasures, which she lovingly bestowed on her family. After Stuart’s passing, Adeline moved to Mirabella, where she enjoyed all the comforts of retirement and security that it offered. She made new friends and took comfort from the caring staff who always went above and beyond. She supported the Mirabella Foundation, and knitted children’s sweaters with a group of ladies for World Vision. Adeline is survived by her son: Paul McTaggart (Darlene); her brother, Ray Johnson, sister-in-law Maxine Johnson; her grandchildren: Scott, James, Stuart McTaggart, and Jennifer Laursen (Stefan); her great grandchildren: Ethan, Camilla, and Charles Laursen, Erika DelaRosa, and Kai and Reina McTaggart; and 10 nieces and nephews. Adeline was preceded in death by her husband Stuart James McTaggart, her son James Stuart McTaggart, her brothers Maynard and Floyd Johnson. She was a woman of remarkable grace who will leave a lasting memory for all fortunate enough to have known her.